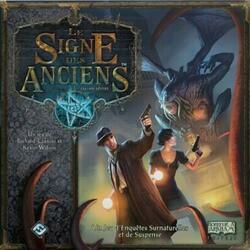 In The Sign of the Ancients, a cooperative game inspired by the writings of H.P. Lovecraft, 1 to 8 players play the role of investigators fighting to fight a Great Ancients, gigantic creatures remaining in the space between dimensions. By throwing special dice, players will experience adventures in the museum and its surroundings, where these strange creatures are concentrated. The courage and skills of investigators earn them rewards, including the famous Elder Sign this strange symbol used to enclose the Ancient and win the game. But the clock turns and every night, at midnight, the Great Elder approaches his waking. If the investigators do not hurry to lock him up, he will awaken and Humanity will be almost doomed!